Buy this, why don’t you. 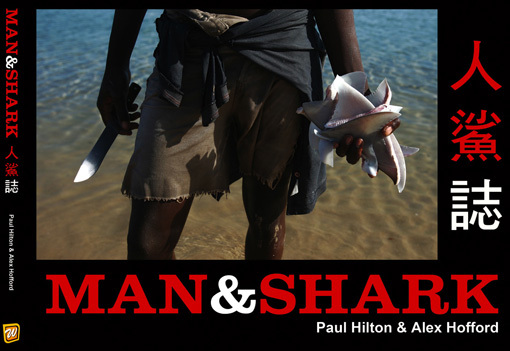 A fascinating book packed with photographs and a few words, all about how our taste for shark fins is destroying shark life. Produced by Paul Hilton and my old and loyal friend, Alex Hofford, whose blog is always stacked with extraordinary photo-stories from China, where he has lived and worked as a professional photographer for over a decade now. I’ve seen a lot of the pictures in here and they are quite brilliant. There is also a very disturbing video of shark-fin slashing here: Japan’s Shark Fin Capital. Great piece by Mr Miéville. Only yesterday, as I returned from a media-free week away, was I spitting over someone’s shoulder on the tube whilst reading their shoddy freeby. If they’re blood diamonds, the Evening Standard is blood paper, I muttered to myself. Perhaps I shouldn’t even be commenting on this thoughtful post by Steve Mitchelmore because I haven’t actually read the books referred to in the two pieces by Geoff Dyer and Lee Siegel. However, Steve’s piece provoked a series of thoughts in my head and so, I don’t see why I shouldn’t respond in some sort of shape over here. And although I’ve never called myself a war reporter, I have worked as a journalist in two wars & I have thought long and hard about questions of the representation and reporting of war. The first key stumbling block for me is the distinction made (and it is constructed, I’d argue) between fiction and non-fiction (or shall we consider it non-fact and fact?). There comes a stage in war (and peace), if you hang around long enough, where you can no longer be sure of what constitutes fiction and what fact, what is illusion or the *truly* physical, what is dream and what is fear, and what is imagination and what is trauma. The longer I have pondered war, disaster, catastrophe etc, the less comfortable I am with (what Dyer refers to as) ‘narrative drive’. I might add the word ‘neat’ narrative drive, and be left feeling queasy for the lie. The weighty observations of reporters (still, for the most part, people from the over-developed world who fly in and fly out of the developing world) when they cross into ‘the other side’ feel, to me, increasingly inadequate the more I’ve read of them. It’s as though they (or we) are hardwired to come out with lines that compare an exploded skull with the waxing waning moon. And it leaves me feeling, well, nothing really. Hardly moved by yet another privileged individual’s wading adventures into the, er, real world. We can never make present the full horror of a given event with use of a witness, or a text, or a photograph: it is always obscene (off-stage) and beyond our grasp. This sums up everything I felt, over and over, as a BBC correspondent, attempting and failing and attempting and failing to somehow provide World Service listeners with an authentic report of war. I concluded that nothing can ever capture the horror, the trauma, the catastrophe of war – and what is so strange about the modern total-mediated world is that we seem to insist the very opposite. I’ve read my fair share of journalists’ accounts of war and time and again I’ve asked myself the same question. What is it we are hoping to get from these books, these stories of wars? Is it that we hope to alleviate our comfortable guilt by informing ourselves about the horrors (out there)? I always used to believe – perhaps I still do – that if you want to know what a war is really like, why not go and put yourself in one. Take your real physical self and place it in the war. That was my own method, my own solution. And I learned a great deal, particularly when faced with a choice of probable survival or probable death (I turned out to be much less selfless than I had hitherto believed). I went for the chance of survival every time (and tried not to think about the others we left behind). I also learned the impossibility – or perhaps futility, or perhaps indulgence – of attempting to capture the experience of war. For several years I thought about writing a book about the Angolan war. Many many people told me I should. I had tonnes of notes, hundreds of ideas, plenty of shocking material. But no matter how hard I tried, the bits and pieces I produced felt futile and false. What is the point of this? I asked myself that question again and again. People sometimes responded, So that others can know what it was like. As if that was somehow important. But you’ll never know what it was like by reading a book of reportage. And even if you do get some kind of glimpse, so what? Where does that leave us? … If I could go back to what I was saying about Nietzsche: what people get excited about in his work is this notion of affirmation: an affirmation in relation to death. I can affirm the meaninglessness of the universe and the ultimate meaninglessness of my own life, and heroically assume that. There’s something almost disgusting about that thought after the holocaust, it seems to me. Adorno puts his finger on this quite well in the final part of Negative Dialectic. He’s concerned with after Auschwitz. He says that a new categorical imperative has imposed itself on humankind: not to let Auschwitz repeat itself, and not to hand Hitler posthumous victories. He goes on to say that the situation of the death camps is best described not by descriptions of them, but by, for example, the work of Beckett. Why? Because it doesn’t say anything about them; it doesn’t attempt to represent what took place. What would be the least disgusting aesthetic response to this situation? In the first draft of Happy Days… the play started with a nuclear blast and a radio voice saying ‘Nuclear War has been declared; London’s gone, New York’s gone etc’ – and then Beckett just cut that but left the post-apocalyptic landscape intact. You get that through Beckett’s oeuvre. There are points where he almost spells it out, like where Vladimir says to Estragon towards the end of Waiting for Godot: ‘Can’t you see the bodies piled up in mounds? Can’t you smell the decomposition?’ He could almost be talking about Auschwitz. Yes. And he doesn’t have to lay it on with a bloody trowel. I would suggest that it is not so much that the novel is out-dated but our (mis)understanding of life. When are we going to finally get to grips with the truth? There is no border between fact and fiction! We’re the fools for insisting on that for so long, clinging on (oh, the irony’s lovely) to that illusion. Again, look to Sebald. Look to Beckett. Did they not point us in the right direction? Is it really so hard to grasp? To return to Steve Mitchelmore’s original post, his opener points directly to this. The illusion, the real, the memory, the imagination… and how we decipher these, if we are so inclined to do. I’d discourage that inclination. And I’d discourage phrases like ‘narrative non-fiction’ or what Steve refers to as ‘creative non-fiction’. I’d argue that creating a (neat) narrative out of the ‘real’ is what turns it into fiction, or the make-believe. The kind of non-fiction that offers a narrative is, for me, a wee bit shoddy because it’s about the author refusing to take risks. I’m not saying there isn’t good stuff out there – I really enjoyed, for example, Anna Funder’s Stasiland and Anthony Lloyd’s My war gone by, I miss it so – but the only non non-fiction I’ve really gained from lately(and it simply won’t let me go) is the work of Sebald. Death lurks around each corner; soldiers can live or die in the next sentence. Unlike in the novel, the author here has no control over life and death. In this – perhaps paradoxical – way, war reporting has erased chance from writing. Paradoxical because, while chance fills the lives of the soldiers, it is erased in the telling: everything is necessary, already written in nature. I’m not sure I fully understand this point. First up, journalists do make things up all the time. Not only print journalists, but TV journalists too. How can we be so sure that the author-reporter hasn’t some sort of manipulation over the life and death around him? Journalism and the advent of 24-hour news and the fact that we now live in a world in which everything is mediated (and in which journalists from the over-developed world are constantly proving to us and themselves how brave they are) probably does mean that a large degree of chance has been erased. Indeed, the culture of embedded journalism is surely an indicator of this. But the individual journalists still do have a choice. They don’t have to write like this. They don’t have to produce these accounts of their action-packed, terrifying lives of survival. They choose to go and visit these wars, after all. The people who live there are the ones with no choice. The locals. Not the foreign journos. But perhaps I’m digressing here. I suppose that the real problem with journalism for me, is the insistence on certainty. Doubt – which is raised so carefully at the top of Steve’s post – is not something ambitious (western) journalists admit to. If you do admit to doubt or, like me, obsess in doubt, you are unlikely to get very far on the forrie corrie ladder to glory. And yet, from where I stand, working in a war can only leave you doubting profoundly what you thought you knew. And doubt, in my opinion, is absolutely crucial for good writing and important observation. P.S. As for Jon Lee Anderson telling Dyer that he doesn’t have time for embellishment: I remember his piece about Angola in The New Yorker several years back. How we all chuckled in Luanda when we read his descriptions of life on the streets of the capital. He’d embellished quite plenty. There’s a thoughtful response to all this over at Thinking Blue Guitars.